Oslo-based Reiulf Ramstad Architects are champions of bold and simple architecture, and they’ve achieved that aesthetic once again with the V Lodge, a minimalist, all-year-round cabin in Norway. Clad in pre-patinated pine, the gabled lodge gently blends in and frames views of the surrounding landscape. The structure was created with a V-shaped plan to follow the natural topography and minimize site disturbance. Generous amount of glazing, such as the two glazed end gable walls, frame views of the landscape and bring in natural light. The architects lined the interior with untreated plywood sheets to continue the cabin’s wooden materials palette indoors and to complement the surrounding montane birch forest. The interior features minimalist decor with an open-plan layout in the communal wing; a concrete combined kitchen counter and fireplace divide the space into two separate seating areas. 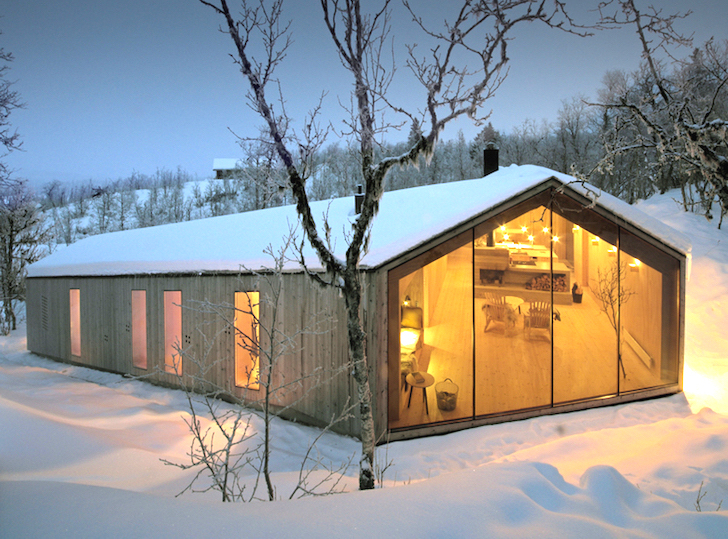 Built for a family of five, the nearly 1300-square-foot V Lodge is located high in the mountains overlooking the village of Ål in the Norwegian county of Buskerud. The architects spatially divided the cabin into two distinct wings. The first wing stretches across the crest of the hill and comprises the living and dining areas. The second wing houses the three bedrooms and playroom and gently descends downslope. Elevation view of the private wing with bedrooms descending down the slope. Generous amount of glazing, such as the two glazed end gable walls on the end of the bedroom wing and at the junction of the two wings, frame views of the landscape and bring in natural light. 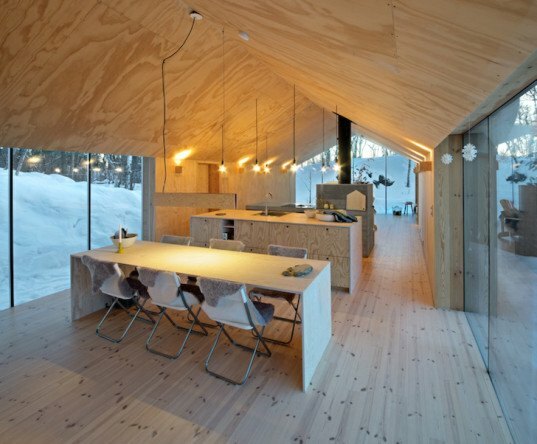 The architects lined the interior with untreated plywood sheets to continue the cabin’s wooden materials palette indoors and to complement the surrounding montane birch forest. The interior features minimalist decor with an open-plan layout in the communal wing. A concrete combined kitchen counter and fireplace divide the space into two separate seating areas. Clad in pre-patinated pine, the gabled lodge gently blends in and frames views of the surrounding Norwegian landscape.